Heat olive oil over medium heat in a soup pot. Cook onion until it begins to soften, about 5 minutes. Add garlic and diced pumpkin and cook for another 5 minutes. Stir in the beef broth, tomatoes, salt and pepper. Bring to a boil, then turn heat to low and simmer until vegetables are tender, about 15 minutes. While soup is simmering, bring a pot of salted water to a boil. Add the kale and simmer until softened, about 3 minutes. Drain into a colander. 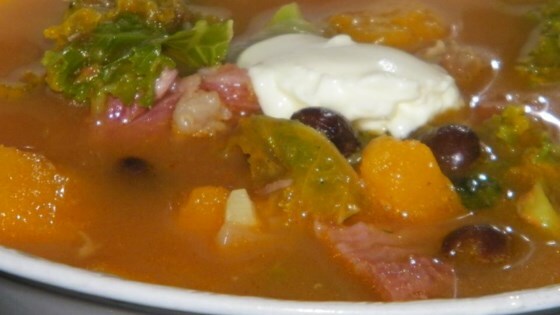 After soup has cooked for 15 minutes, add the kale, ham, and black beans; simmer for another 5 minutes. Stir in the sherry vinegar and sorrel; remove pot from the heat.